ST. PETERSBURG, FLORIDA – C. Emerson Fine Arts Opened (CEFA) in 2006 with the intention of going beyond familiar ground together with artists whose work is highly diverse and who mix different modes of expression to transcend established categories. As the gallery turns six, it is a proud moment to still feel fresh, unconventional and uncompromising. It is a feat to continually top oneself in art and exhibitions. I’d like to think CEFA has continued to raise the bar, in not only the bay area, but in now the global art market with the quality of art and artist proudly exhibiting. The gallery perspective is not about showing art that might be readily understood and accepted by the mainstream. For CEFA, it is about doing what feels right and being confidant in trying new things continually. The goal is to spark debate or to push the boundaries of a given media. As C. Emerson turns six, a celebration of experimentation and play is the concept with “Have Your Cake and Eat it Too …Remix Edition”. “Have Your Cake and Eat it Too…Remix Edition” is a mixed media exhibition to include, drawing, mixed media installation, painting, photography, and sculpture. There will be special live performance art at the opening reception by Working Method Collective. 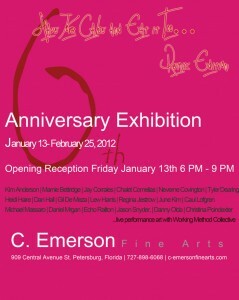 The opening reception for “Have Your Cake and Eat it Too…Remix Edition” is Friday January 13, 2012 from 6 P.M. to 9 P.M. It is Free and open to the public. Our collective work begins with the relational aesthetic philosophy that the art viewer wants to be more involved in the piece. Realizing that in our current cultural climate much of the watching and looking is now done at home, and that contemporary art can now be something a community of interested people can create or experience together. We like to get the gallery goers involved into the experience in a way that allows some to dive right in and others to tiptoe. We are never bossy, and we never trick people- we just set up the situation and let people engage or not. We have discovered that when this comes together in a way that is thoughtfully semi-choreographed, but elements are genuinely left to chance, a palpable enthusiasm takes over the crowd. We are addicted to creating that enthusiasm. Our group is composed of eight visual and performing artists, each pursuing a Master of Fine Arts Degree from Florida State University; Marnie Bettridge, Jay Corrales, Chalet Comellas, Tyler Dearing, Heidi Haire, Dan Hall, Echo Railton and Christina Poindexter. Within our personal studio practices each of us maintain a singular and unique voice that relates to our individual backgrounds and research interests. We are painters, photographers, designers, animators, and sculptors. When the group comes together collectively these varied strengths help to create a rich resource of possibilities. Most of our collective work is ephemeral in nature. As a group we enjoy pointing out that the work or the process of discovery, is the place where art happens and the objects left behind are only the remnants of this amazing experience. 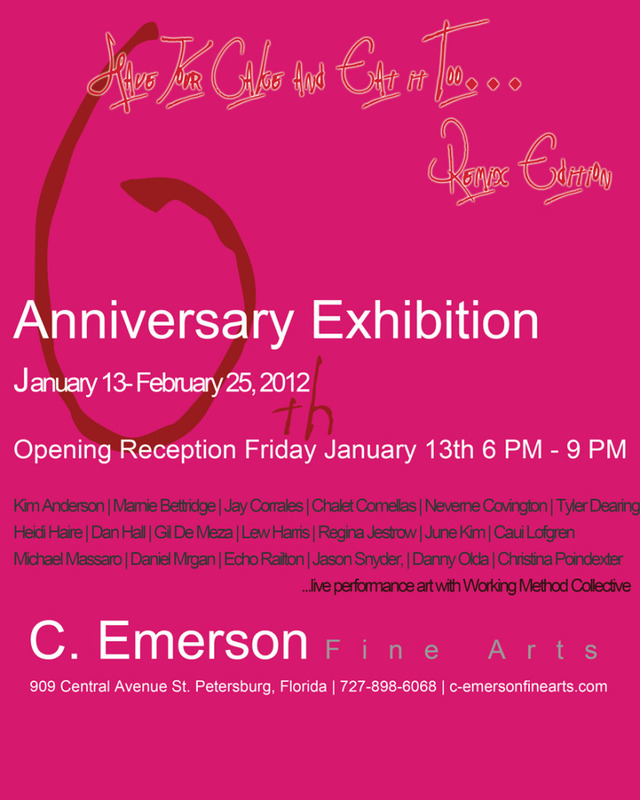 The opening reception for Have Your Cake and Eat it Too…Remix Edition Friday January 13, 2012 from 6 P.M. to 9 P.M. It is Free and open to the public.